The Weekly Work Schedule Template is a tool that you will find extremely useful to have on your business or personal desktop. Using our completely free and easy to use work week schedule template will be a pleasure. You can customize the basic format to fit your needs, and the work schedule template weekly is simple to download and easy to customize to Excel. The worksheet can be set up with headers customized to your department or small business. You can add your employee name and information in the far left column and then have columns for each day of the week. You could even divide the days into time periods, for example, you could break down the day into a morning period and afternoon period. If you have a landscaping business for example, you could keep track of which employee is at which location each day i.e. for John Smith, you could have him cutting grass at the Burger joint on Monday morning, and then weed eating at Mr Jones house in the afternoon. You can also keep a track of your employees hours on the sheet. 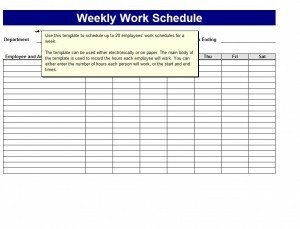 The weekly work schedule template can be used to gather multiple types of information to track employees hours for payroll and also to track services to clients. When you are reviewing an employee for an evaluation, these worksheets will be a valuable tool. For example, the work week schedule template will show you how often an employee has taken time off or come in late. You will no longer have to rely on memory if you need to counsel your employee about time and attendance. You will have documented evidence regarding an employee’s work habits. For the small business owner, this work schedule template weekly will be an excellent organizational tool. The template is entirely free to use and easy to download. You will find many ways to use the template and saving the template to Excel will give you all the capabilities of using an excel worksheet to gather the data you need for your business. Using the template for your day to day record keeping will free up your valuable time for other tasks.